What says welcome spring like a fresh salad? When the weather starts warming up I start craving fresh, crisp greens and lighter foods. There is actually a reason for that – they’re in season! Ever notice that you tend to associate certain flavors with certain seasons? Ever notice that our bodies tend to crave what they need, and that seasonal produce tends to fulfill that need? For example, how convenient that citrus, full of vitamin C, is in the peak of production during cold and flu season? I know it is tempting to want to eat what we want when we want it, but there is something special about waiting to bite into that first locally grown strawberry. Or waiting until the heat of summer to slurp up some juicy watermelon. Food most certainly tastes better at the height of the growing season. If you haven’t noticed already, we try to base our Whole Foods menus on seasonal produce. Here is another great recipe to add to your seasonal rotation. Fresh, crispy greens are now in season! I like to serve it in a dish like this so everyone can make their own salad. 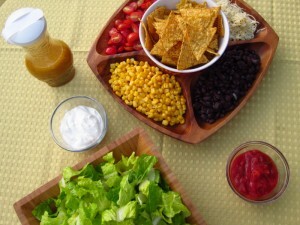 In a large salad bowl, gently toss all salad ingredients together (or set out in serving dish as pictured above). In a small bowl combine all vinaigrette ingredients except the olive oil and stir to combine. Slowly add oil, whisking to emulsify. (You can also pour all of the ingredients into a jar with a lid and shake it. You can just store the extras right in the jar.) Pour dressing over the salad and toss gently to combine. 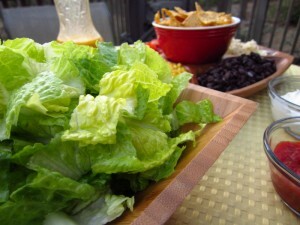 Note: If you prefer you can divide the ingredients evenly and layer in individual salad bowls. Then top with dressing. Chicken, beans, corn, and cheese can be cooked and frozen ahead of time if desired. Dressing can be stored in the refrigerator for up to 3 days. Your recipe is featured on Full Plate Thursday this week. Hope you have an awesome week end and enjoy your new Red Plate! This looks really pretty and sounds really good. Adding to the file to try. By the way did you ever find out what happened to the missing avacodo? I found it stuffed in a bag with some other produce in the fridge a few days later! So sad. This salad is wonderful and can be altered for individual tastes. I’ve eaten it several days in a row.